Handling client side validation using the HTML5 validation api is getting easier due to the wide support on modern browsers. With HTML validation api you don’t have install any new package and learn its api. Remember this might not be apt for your application and use case. Read the detailed incompatibility issues here. This post doesn’t intent to cover all the use cases and corner cases, but to give intro to using HTML5 apis in a Vue app. For the basic version we don’t have to do anything specific to vue. Just need to bind @submit to handleSubmit action will trigger the validation and show error message in native way. 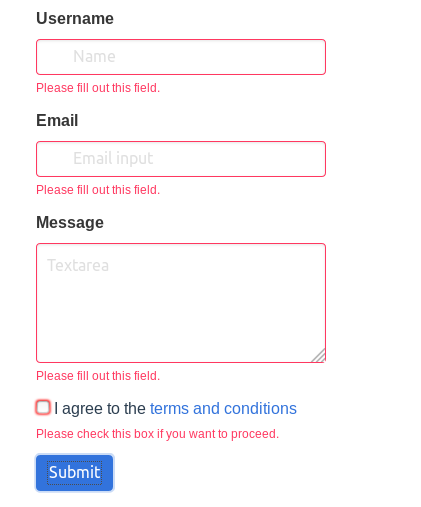 When we use form.submit(), it wont trigger the native validations. This requirement usually arise when we want to do some task (like update state) before the form submission. In such cases we have to trigger the validation and report it manually using checkValidity and reportVaidity methods. In this case when checkValidity is true we have to call handleSubmit directly since the submit event wont be raised. It now we didn’t controlled how the error message are shown to the user. Consider we need to show the error message in a uniform way across the browsers and don’t want to hide those automatically. In such case we have to bind callback to form invalid event, to collect error message from all the child inputs. We will use validationMessage property on the input element to get the localized message for the validation failure. return this.fieldErrors[field] ? "is-danger" : ""
In this make sure to use capture modifier like @invalid.capture.prevent since the invalid event won’t bubble. if you have any feedback, please drop a comment below.